Well, you know if you've been reading our latest posts or follow us on Instagram that I'm pretty much living the zombie lifestyle at the moment thanks to my low iron levels - but there has been some good news lately! You might already know that in addition to being a coeliac, I also have a million and one food intolerances. My team of doctors hoped that they were only going to be a temporary issue and that, as my stomach would heal from the gluten damage, the intolerances would begin to disappear. And they are disappearing!! I can now enjoy mangoes, grapes and coconut without any issues - mangoes being one of my foodie obsessions at the moment. As my iron levels are so incredibly low at the moment - and I have at least a month to wait until an iron infusion (if I even get one) - I'm feeling pretty rubbish. I don't have the energy to do much of anything - I still walk of a morning, but only because my iron levels are also effecting my circulation so if I don't walk, I'm crippled with pain by the afternoon. My lack of energy is also the reason I haven't been posting as often - because sitting at my computer feels like a total chore. Did you know that chia seeds are full or iron?! 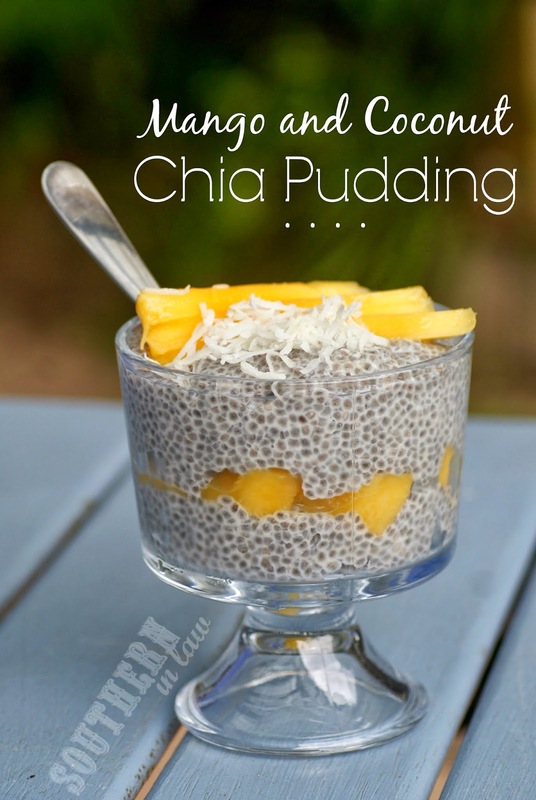 This recipe has over 37% of your RDI of Iron just from the chia seeds. That's way more than a steak - and better still, the vitamin C from the mango will help you to absorb more of that iron. I mean, if you need to increase your iron, you want to do it in a tasty way - right? 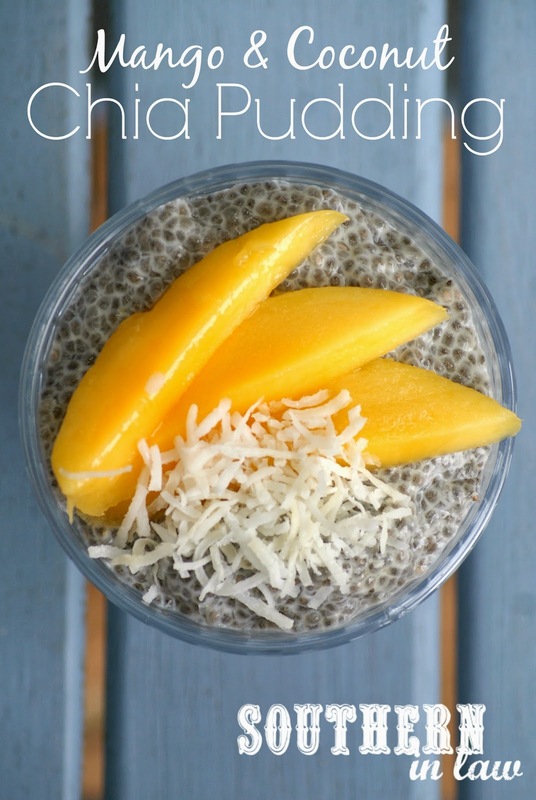 And I promise you, this chia pudding is amazing. I ate it for lunch yesterday and even Jesse was eyeing it off. Combine all of your ingredients and leave to soak in the fridge for about an hour, stirring once whilst waiting. If you want your pudding to come together instantly, put your chia seeds, milk and vanilla in a blender and blend until thick. Top with mango and shredded coconut and devour. You can also use 1/2 cup coconut milk and 1/2 cup almond milk if you want to boost the coconut flavour! But tell me, what's the one food you are loving at the moment? Hi! I love the illusion of the spirals on top. So all I have to do is use a toothpick before baking and draw a spiral on top, then add the sugar? Can you explain the technique a little more? Thank you! Do you mix the eggs and banana in a bowl first? Do you really find this filling enough for breakfast? I actually had this one for lunch, but I've had similar versions for breakfast and they really are filling. 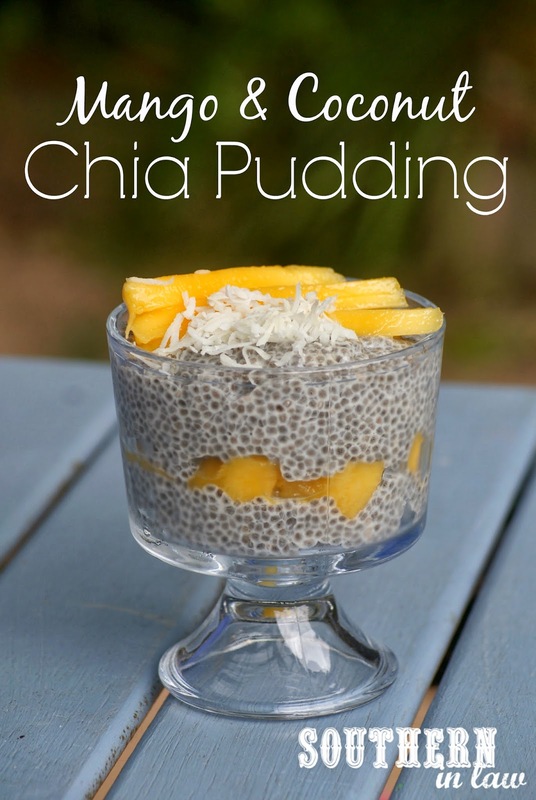 The chia seeds are full of protein and fibre and you can certainly add some nuts or nut butter if you like! I wish I had some almond milk in the house - I'd be making this right now! I love mangoes too! Food I'm loving right now - dates! I took 6 out with me shopping yesterday just to munch on before/after lunch when I get peckish. This was disgusting. Too much salt and way, way too much baking powder. I don't understand, why is there SO much baking powder?? Def will NOT be making this again and def NOT recommending it to friends. Can you use skim milk or would that be too liquidy??? You can use any milk you like! Skim, almond, soy - you name it! You'll have to let me know what you think if you make it! I'm with you, dates are deeeeeelish! You could try it out - I'm not sure how it would affect the taste/texture/baking time though! Ah! Perhaps it's just an odd match! Sometimes I find gluten free baked goods stick a little more to the papers so I often buy non-stick cases (which tend to be brown baking paper) or spray/grease the inside of the cases! You'll have to let me know how it goes if you buy the flours! I love iHerb and it's actually cheaper for me to buy stuff on iHerb and ship it all the way to Australia - so hopefully it's the same for you! I have a question! Can this be made in a square baking pan? It sounds delicious, but I'm having a hard time finding ramekins and my dinner party is tomorrow night. It may have been the cocoa powder you used as some are stronger than others. Next time just use a little bit more! It's quite a rich chocolatey flavour. Hey Meena, the cake looks great! We definitely prefer the cake cold but I've never had anyone say they could taste the applesauce! It's a family favourite and many of our friends make it too as they can't believe it's healthy. Are you used to really sweet baked goods? That may be the issue as this cake doesn't use much sugar at all so can be a little different if you're not used to it. Just made these and they are delicious!!! I used coconut milk, coconut sugar, and 1 1/2 cup oat flour and 1/2 cup millet flour. The batter was delicious! I used all oat flour and i used rice milk. I also put in a squirt of agave nectar instead of the sugar. They turned out reallllllly and not done all the way. so i would love to try this again sometime altering it to work better for my style. I LOVE this recipe!!!! I have changed a couple things but nothing too big. I just started a healthy food blog (I live in Mississippi and have a burden to help people here have a healthy lifestyle) and would really like to post this recipe with my alterations and give you full credit for creating it. Would you be ok with that?? Hiya! If I were to substitute the flour for Gluten Free Self Rising, would I still need to add the Baking Powder/Soda? :) Really looking forward to making these, thanks!! We often use gluten free self raising flour instead of plain flour and keep the recipe the same (still adding the baking powder/soda) as it gives the cake a little extra rise (which GF baked goods so often need!). Hmmm, definitely going to give this a try! How is this healthy!? there is still lots of sugar and flour? Alexa, it's a healthier version - of course it's not a carrot, but when compared to traditional chocolate cake recipes it is far healthier and a fraction of the calories. I love this recipe! I have made it about 10 times now and I love it each time. It is my Christmas dessert of choice this year with a bit of peppermint extract in the icing and crushed candy cane on top. Thank you for sharing! I don't need to feel so guilty about enjoying this cake. Yay! I am so glad you love the recipe, it's one of our absolute faves! It's not healthy, it's just healthier than regular chocolate cake. It's still chocolate cake. I tried it, it's amazing! Thank you for this great idea! Yay! I am so glad you loved it, Laura! Hope you loved it, Danielle!